Thasmae Chetty, fondly known as Tas, is the owner and director of T. Chetty Registered Biokineticists. She started out as a school teacher for the better part of 10 years and is now one of the preferred biokineticists in Durban and surround ding areas. She is a dynamic and enthusiastic biokineticist who has a special interest in chronic disease and lifestyle management. Tas is passionate about using this knowledge to motivate and empower positive lifestyle modifications in her patients. 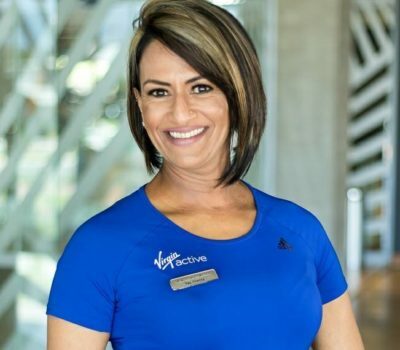 When she isn’t working with her patients, she spends her spare time working on her own fitness to lead by example. Tas lives by “love what you do and never have to work a day in your life” Investing in each patient’s well being is what sets us apart from the rest. Social responsibility is very important to Tas. To use her passion to educate empower and create an awareness of the importance of exercise as medicine. Tas has many accolades that can be attributed to her dedication and commitment to her work. The most recent is the acknowledgement by the Business Woman’s Association of her contribution to the promotion of biokinetics. Nhlakanipho is the Senior Biokineticist at our Moses Mabhida Virgin Active branch. He joined the practice in 2017, and his areas of interest include orthopaedic rehabilitation and sport specific training. He aims to continue growing with the practice. Shivesh has been with the practice since 2015 when he completed his internship with Tas. He is the Senior Biokineticist at the Bluff Virgin Active branch. Shivesh enjoys the treatment of musculoskeletal pain, orthopaedic rehabilitation and corporate wellness. His sport of choice is motorsport, and he competes nationally in the VW Polo Cup. Error: Error validating access token: Session has expired on Thursday, 20-Dec-18 23:38:26 PST. The current time is Wednesday, 24-Apr-19 02:57:58 PDT.